Girls at Work Inc., the award-winning nonprofit organization that empowers girls through woodworking in after-school and summer camp programs, has announced plans to move its workshop to the headquarters of FIRST, the international student robotics program, in the Manchester Millyard. The move is scheduled for May 2020. The move will more than double Girls at Work’s existing workshop space and position the program for a partnership with FIRST, which inspires young people’s interest and participation in science and technology and motivates them to pursue education and career opportunities in STEM fields. 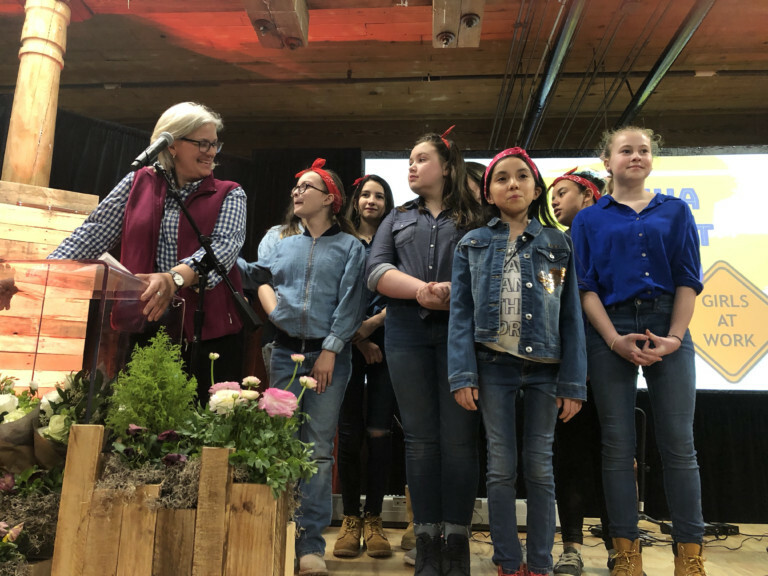 Elaine Hamel, Girls at Work’s founder and program director, made the announcement of the move at the organization’s March 30 DIVA Night fundraiser, held at the FIRST headquarters. “We are so excited to work with FIRST and Bosch, our two flagship sponsors of this year’s DIVA event, who will help transform this room into our new home,” Hamel told the crowd. Hamel said Girls at Work will be working with several area businesses on the move, including Timberland. “It really does take a village and our growth is a result of a strong village,” she said. After visiting schools and summer camps in Manchester and around the state as a mobile program since 2000, Girls at Work has been housed at 4 Elm St. in Manchester since 2014. Having a dedicated workshop allowed the program to grow quickly – more than 15,000 girls have participated in a Girls at Work program since 2000. “This move will allow us to connect our builders with more opportunities through STEM and robotics education, reminding them that the power and strength they discover through building exists in their minds, their bodies, and the spirit in their hearts, and that power can create stronger futures,” said Beth Dever, executive director of Girls at Work. “This is a win-win collaboration between two like-minded organizations with lots of mutual respect and a genuine desire to support good outcomes for under- served youth,” Bossi said. Dever said a capital campaign strategy will be rolled out on May 30 to help in the buildout of the new space. © 2019 NH Business Review.